Keyboard and Mouse commands in Google Map. Over the years of organizing open paddles for Paddle Manitoba one of the most common questions from participants has been: "where can I go paddling"? The answer to this question usually starts with me asking even more questions to figure out what kind of paddling, how far, trip interest, and skill level. Usually people that come out to open paddles, and ask about destinations, are looking for easy day trips or just an afternoon paddle. This page was setup for those people interested in a quick local paddle; if you are interested in longer trips or something a little further afield there are a number of other resources available. Since I live in Winnipeg I have spent some time paddling the local rivers and creeks looking for places to get on and off the water. The following list includes the larger rivers, creeks, and some ponds, in Winnipeg which usually have at least some navigable sections for extended periods each year. The map to the right should be interactive allowing you to zoom into different areas across Winnipeg showing locations that I have stopped at over the years. The points with an arrow are the locations that I have used more often. The approximate distance between the river points has been provided for each river below. It is possible to paddle both up & down stream from most of the put in points that I have identified. Traveling upstream (against the current) can take several times longer than the same distance downstream, take this into acount. Tear drops indicate ponds that I have checked out. Only a few of the sites have docks or boat ramps, the City Winnipeg maintains a list of dock and boat launch locations on their website with more information. Most of the other sites listed here are just a river bank with some kind of access. In most cases the access is easy with only a short walk. A few of the locations may have more difficult shorelines or river banks to climb down. The shorelines of the rivers, especially the Red, are often muddy making access to the water difficult. Typical of many prairie rivers the levels get lower throughout the summer providing some challenges for late summer and fall outings. This list is certainly not exhaustive and I certainly have not found all of the access points, there are still other locations such as Bun's Creek and Omand's creek along with many retention ponds that can still be paddled at some times of the year. I visited all of these sites during the summer and fall (August-October) of 2009, not always from a canoe, to confirm there was still access the river from the shore. I have also canoed to or from or past all of these places sometime over the last 30 years. Access to the rivers is surprisingly dynamic depending on the season and water levels. There have also been quite a number of changes over the years due to zoning or building, the river bed itself has even changed in a few places. I discovered a number of places this fall (2009) that I had used in the past that were now either fenced or marked as private property. A few additional places the river bank had collapsed so it was no longer suitable for reaching the water. On the other hand in my explorations to check old sites I found a number of new ones that I did not know existed. If you want to get out for a paddle on the rivers, creeks, or ponds around Winnipeg please remember to bring the appropriate safety equipment, wear a PFD, tell someone where and when you are going, and take careful note of the water conditions in light of your skills. Care must be taken when approaching the river as the river bank may be unstable or collapse - this is particularly true when the water is high or where there is a drop-off to the water. Check with the City of Winnipeg River Patrol to see if there are restrictions or notices on use of the river. When heading down to the water please respect private property and remember conditions as well as access might change over time. If you drive remember to check for appropriate parking or your car may be towed or ticketed. The headwaters of this little river are found near Portage la Prairie; it meanders across the prairie until it eventually passes through the town of La Salle and finally into the Red River near the floodway control structure south of St. Norbert. At La Barriere park there is a dam and further upstream, near the town of La Salle, there is a large riffle structure both of which keep the water level deep enough for an enjoyable paddle over the summer. Typically the river is slow moving (really a long skinny pond) for much of the summer but don't be fooled after heavy rain and in the spring there can be a considerable current. La Barriere Park (5km south of the Perimeter hwy on Waverley). This is a very popular place for going out on an evening or afternoon paddle. Most evenings and weekends there is a good chance that you will meet other people paddling. This is the location that Paddle Manitoba runs Wednesday evening paddles. Paddling up stream is always possible, down stream gets a little dicey (if possible at all) later in the summer when the river is low. At various times, usually in the spring or after heavy rain, the dam and the bridge are often underwater - there may be strong currents and a drop over the dam at these times. Town of La Salle off of Vouriot (North east side of La Salle off of River Wood Dr- by the foot bridge). This is a very pretty little park with a wonderful footbridge across the river. Just down stream is a fairly large riffle structure - be careful of currents and the associated drop when the water is even a little high. You can start at Elie and paddle into Winnipeg. Elie to Starbuck is 33km as the river flows. Downstream of the Elie dam, for about 8km, be prepared for many downed trees and toe dabs. The distance between Starbuck and Sanford is ~23km; Sanford to La Salle is about 30km. There are lots of bridges providing alternative egress sites. It is a nice quite little river - further out be prepared for fallen trees blocking the channel of the river. There are several riffle structures (Starbuck/La Salle), a low head dam (between Starbuck and Sanford), and two regular dams (Elie/Sandford). There is very little current except in the spring and after heavy rain. It is possible to paddle further upstream from Elie as well, the dam helps, but the river starts to get pretty small. Creek Bend Rd.. With recent building access is no longer as easy and parking is more problematic. Behind the French School division office (1095 St Anne's Rd) just south of Warde there is access to the river. Parking will be an issue during the week. John Bruce Road Putting in at this foot bridge to paddle south to Shorehill drive (and further) is one of my favourite city paddles; just like being out in the wilds with out the long drive. The river bank is starting to see a lot of building on the west bank which is unfortunate, let's hope that the current look is temporary and the new owners respect the river. Morier Park (near Egerton & Morier). This is a pleasant little park to stop and have a picnic when out for an afternoon jaunt. There are a couple of routes down to the river, the one to the south is shorter and more direct. Evans St. at Cusson. There is access down the bank even though it is a little steep. Dropin below the 'rapids'. South side of Happyland park. Take this chance to stop and do a round of Rrisbee golf. Note: Much of the Seine River goes through golf courses. Watch for flying balls and, sometimes, golf clubs. Right before Provencher the river is usually very shallow. For many years there has been a narrow spot with quick currents and a drop just upstream of Gabrielle Roy Park. A little further, past the rail bridge, there was an extensive, and badly needed, remediation project to clean up the old IKO site, the river was closed over the fall of 2009 at this location. The river was opened again in 2010 but it looks a little like a moon scape; a lot of replanting and landscaping has been done so it will be very nice once it fills in. The above sites are all downstream of the Red River Floodway Siphon - a U shaped pipe that carries water under the diversion. It is a significant portage (not long just annoying) to cross the diversion and get back to the original river course. You can start outside the city at the end of Carriere Rd and paddle through Grand Pointe, Lorrette, and points beyond (Dufresne, St. Anne, ...). You must portage over hwy 59 and there are often many blockages (e.g. downed trees) elsewhere. Some sections unfortunately have been straightened and have the feeling of a big ditch. Further out it becomes quite a small river. Although I have only paddled as far out as Lorrette I expect that it becomes problematic to navigate later in the spring and summer as the water levels go down. 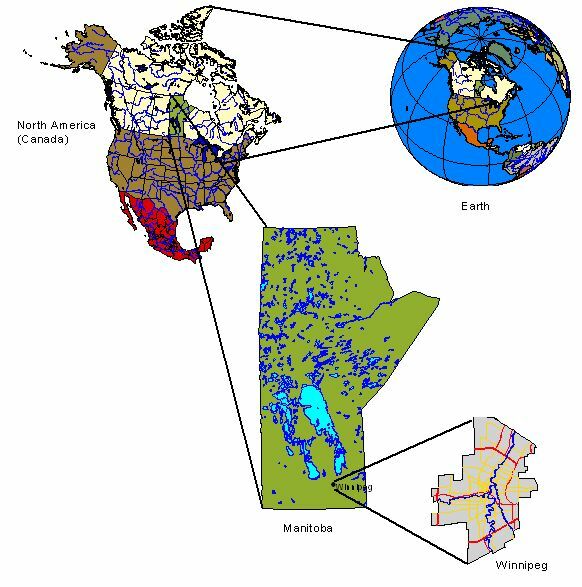 With headwaters in Saskatchewan the Assiniboine River wanders across the prairies for over 1000km before entering Winnipeg from the west. The river provides an excellent opportunity for touring Winnipeg from the other side of the bank. It is usually too shallow west of the Maryland Street bridge for larger and even some medium sized boats giving paddlers a chance to explore and experience Winnipeg's second largest river without competing with much boat traffic. Paddling from Headingley to the Forks (Red River) is a ~4 hour enjoyable paddle. If you are not into this distance don't fret there is ample opportunity for shorter paddles. Be aware that the current on the Assiniboine is quite fast in places and returning against the current can often take two or three times the amount of time it took going out with the current. In many places the river is very shallow, especially from mid-summer through the fall, which also makes a return trip tricky and slow. If you enjoy poling there are a number of sections where you can practice (e.g. St. Charles to Lanoo and west of Assiniboine Park). South Headingley - Roblin Blvd & Rodney St. There is a small parking lot here and good access to the river with gravel bank. I have often paddled from Beaudry park (even further west) to this location. Coleridge Park. Great access - a nice little park with benches and a stone path and stairs to follow. There are some larger stones at the north end of the park that make for a good landing. Several Access points off of Assiniboine between Coleridge and Westwood - Bedson, Rouge, Westwood. The shoreline at these points drops down to the river so you might want to use Coleridge instead. In the 1940 & 50s the site at Rouge was a swimming hole called Westwood Beach. Woodbridge Rd (Near Assiniboine Cres - beside pedestrian bridge over Sturgeon Creek). This is another spot that I often use as a drop off/pick up location when paddling either Sturgeon creek or the Assiniboine. You can also launch from below the Moray street bridge (west side) but this is easier and nicer. Assiniboine Park (East). There is a put in just above the faster/shallow water near the east end of the park - near where the road turns away and many people picnic. There is quite a steep/high bank but there are several trails down that should be easy to navigate. There are several very nice picnic locations near here. Assiniboine Park bridge (North west side). I usually park on Deer Lodge Place but in the park also works. I have often paddled with family friends making a stop here for a picnic, a sundae (across Portage), head off to the zoo, or just use the washroom near the duck pond. There is a little island just up stream on the north side that has 'rapids' one the narrow side. You can paddle through the narrow channel and back around for some fun. Wellington and Doncaster. There is a storm drain just below this interesection (south side of the clearing). It looks like there is a big difficult hill to climb but there are trails down from either side that are fairly straight forward to walk down. Near Wellington and Renfrew. Park near the tennis courts and walk down to the river across the park. There is a climb required to get down to the river often with broken glass - it might be easier for the faint of heart to pick another location such as Omand's creek across the river. Below the rail bridge there is usually enough current (dare I say little rapids) to get warmed up for some moving water. Palmerston Ave & Aubrey. The 'bridge' here is not really a bridge but a pipe crossing the river. Access is relatively easy and the shoreline makes it easy to launch a canoe. Hugo St. I have been picked up here on a number of occasions. Unfortunately it has often been after a peak in the water level and the steps/launch have been muddy - really it is a nice place. I have dropped in here on a couple of occasions to paddle down and watch fireworks from the river near the Forks. Kenaston Bridge (just west of) to Omand's Park there is swift current with small rapids. Remember the current is faster than you might think - going back is slow. The Red is the largest river in Winnipeg. In the spring the current can be quite strong, the river is fairly wide making the strength and speed of the current deceptive. Later in the year the water level is basically controlled by the St. Andrews dam at Lockport (yes that is a long distance from Winnipeg) and the current is not nearly as strong. The river is remarkably flat with only a slight drop (1:5000) across the whole length and even less in Manitoba ( 1:10000 also Statistics Canada Report) where it traverses the bed of glacial Lake Agassiz. When the river breaches its bank it basically fills the bottom of this ancient lake creating in some years (1997 for example) what is locally known as the Red Sea. In the fall the river is drawn down (dam at Lockport pulled up) at this time there may be some extra current but getting to the river across the muddy bank is probably a greater problem. The city also pulls out their docks at the same time. There can be a fair bit of boat traffic on the Red especially around the Forks and further north. There are a few larger boats, such as the M.S. River Rouge, M.S. Paddlewheel Queen and Princess, along with many intermediate sized pleasure boats. You can sometimes meet water skiers coming down the river which always makes me a little nervous. I have seen many personal watercraft zooming around near the forks and as far north as the Perimeter hwy. There is less boat traffic in the south end of Winnipeg - I have often wondered if the speed limits around the rowing club, MPA, and Churchill marina have a chilling effect on boaters. I must admit I don't find the paddle along the Red as nice as the other rivers due to the size and increased boat traffic. On the other hand it is an easy portage from my house so I do paddle a fair bit near Fort Garry. Below Floodway control structure (Turnbull or Courchaine) - watch out for current and eddies from the floodway control structure. Launch well below and away from the control structure. With the floodway expansion project it may not be possible to access the river off of either Turnbull or Courchaine. Cloutier Dr (below Perimeter Hwy bridge). This is not the best location for launching - it is often muddy and has many willows. If you want to explore a little further upstream there is a 'creek' or out-flow from the Ft. Richmond retention ponds that provides access. It has been many years since I have used this point but it should still be there. The last time I went by this point there were 'Private Property', 'No Trespassing' signs at this location. It was not clear if this applied to the land on one side (or other) or to the outflow. I am not sure how it could apply to the outflow as access is required for maintenance - if the area is signed please respect private property. Kings Park. The best access point is west of the main parking lot. There is a clear dirt/mud path that may involve a little scrambling. Sometime in 2014 extensive shoreline remediation was completed here and the bank is not currently suitable for acccess due to large/loose rock. Further south there is another access point where the pond drains into the river. It involves a short portage. At one time there was an access point right off of the end of Kings drive but I don't know if that is still possible. On the east side of the park, opposite the water fall on the hill, there is a water in-take that provides access. Long ago I would also follow the path near Parkwood Place (north side of the park) down to the river - it was never a very good place and I usually had to search for a downed tree to help climb over the mud to the water. You can launch below the Bishop Grandin bridge on both sides of the river. Access is good with rocky shore. Near the west side there is a large storm drain outflow that provides a good launching spot. Try parking on D'Arcy (west) or Blackmore (east). A little further south on D'Arcy, near the golf course, is another excellent place to launch where there has been a bunch of bank stabilization. There is a large dock behind the Pony Corral on Pembina. This is private parking and access but if you eat at the restaurant you may be forgiven. Crescent Drive (just east of South Dr) there is reasonable access. Given the number of fish bait containers I saw last time I was there it is looks like a fishing hole as well. End of Sommerset Ave (behind Wildwood Golf Club building). When I lived in Ft. Garry this was a regular jump off or landing point for trips on the Red and Assiniboine. The storm drain provides a wonderful dock for most of the summer and fall. Toilers Park (near Byng & Riverside drive). A few years ago the neighbours put in tons of riprap to stabilize the bank which made access easier. During the summer of 2014 there was a significant amount of work and shore line remediation being done which may change access. This park was, at one time, the outflow of an intermittent creek that ran through north Ft. Garry, there was a dock nearby and a swimming hole. When you arrive take a look at the plaque and learn a little about the Toilers basketball team. Mager Dr off of St. Mary's. A parking lot with gravel path down to the river - what could be better. Guay Park. This is not a great place to launch a canoe since the bank is high, there is a drop off, and parking can be a problem, but I have gotten in and out here a few times for various reasons. I have added this point mostly from memories of the place that got me into my own boat.... Back in the 1970s I bought my first canoe, and other camping equipment, across the street at The Happy Outdoorsman (433 St. Mary's). There is a bike store there now that I visit almost as often as I did the outdoor store. The Forks There are lots of places to put in/take out. I usually park and put in near Provencher Bridge but that may no longer be as easy with the completion of the Canadian Museum for Human Rights. Stop at the port, lock up your boat and go for lunch/supper. I have taken (portaged) my boat up a few times and eaten on one of the patio's leaving my boat within arms reach. Louise Bridge - either end. There is a city dock at the south east end of the bridge. St John's Park (Near St. Cross). There is a nice launching spot here that appears to have been a short river walk at one point. This is where the M.S. River Rouge was docking so to access, parking, and launching/landing may be problematic. Elmwood Park - between Glenwood Cres. and Bredin Dr. Access from either side of the park. There is a natural gas pipeline under the river here that provides a reasonable launching point. Cathedral and Scotia. Nestled right in the corner, behind a hedge that makes it look like private property there is a gas pipeline crossing that provides reasonable access to the river. Scotia street west of Leila. This is just a little green space but it is enough for getting in and out. A friend of mine lived just a few houses down so I have not used this spot for launching my canoe - better to park at a friend's, socialize, and have a cool drink. Fraser's Grove Park. There are a few locations along this long skinny park, take a walk and see what you can find. Kildonan Park. There is a city dock near the north end of the park after the fence ends. The park makes a great stop for a break and stretch. The only down side is the fence that runs along the river bank for most of the park from the south. McBeth and Red River blvd. You can portage to the river (~350m) by following the trail straight on from Red River blvd. There is a private residence to the left and the secondary dike turning off to the right is private property but access is straight forward. Visit McBeth house or go for a walk along the tails in McBeth park. There has been a dock along the trails from McBeth park but it is a longer portage (~500m). Summerview (off of). There is a path between two houses right in the corner of Summerview lane. This path provides good access down to the river, it might feel like you are walking into someone's yard since there are no fences but go for it. There was an alternative route right beside the campground (Google Earth calls it Fernbank Ave) but there is a gate at the entrance so don't bother even if the gate is open since you might get locked in. There is no access through the trailer park. Bun's Creek. There is a little park here but the gate appears to be locked more often than not. The access point is at the end of the park down to the river where there is a lot of rock put in for river bank stabilization. I have parked on the other side of Henderson Hwy but it is complicated to cross the street with a canoe. North Perimeter Park. This is the end of my Winnipeg tour. There is another spot across the river that I have not used for canoeing but there is a parking lot and good access - when I ride to Lockport with friends we often park there. The Red can be paddled North all the way to Lake Winnipeg - with only a small portage at St. Andrews Lock and Dam. Do not approach the Dam in your canoe! Stick to the main channels through the delta at Lake Winnipeg as the smaller side channels change often through the marsh. Heading south the Red extends into the United States where it forms the boundary between Minnesota and North Dakota. Ste. Agathe is 37km south of Winnipeg (St. Norbert), Morris roughly another 40km further up stream. Be careful around the floodway control structure. Running through St. James this is one of the larger creeks in the city. Portions of it can be paddled most of the summer but usually I only go in the spring and after heavy rain. I have not paddled north of Saskatchewan avenue but I expect it is possible at least from near the Perimeter highway. Beyond that you run into the St. Charles Rifle Range and access/use is restricted. The creek can have very swift currents and dangerous obstacles (e.g. low bridges and culverts) when the water is high - be very careful. There are many small man-made ponds in Winnipeg. The ponds are typically fairly small and quite exposed. Before you paddle on any of these small lakes check the signage since some specifically exclude all water activities others exclude motorized activity and swimming. More information on Winnipeg Retention ponds can be found on the City of Winnipeg website. You should not go in the water when paddling on the retention ponds. In the spring, and occasionally in the fall, you have to be careful of the geese as they can be quite territorial. I have tried to identify locations that are close to the water with good parking (remember to check the signs). Many obvious access points to these ponds are along busy regional roads - look around as there are often small side access points as well. Over the last few years the city and developers have been planting native vegetation around most of the newer retention ponds (cattails, bull rushes, and other emergent macrophytes). There are many benefits associated with this practice: it improves the water quality for wildlife, slows the water flow, increases the diversity of both flora and fauna, limits the number of geese, less costly upkeep, etc... I think it is a great idea but it does limit access for canoes and paddle boats. Whiteridge - off of Vanderbilt Dr. There is a small lot access to the pond here. Whiteridge - off of Prospect Dr.. There is a walk through from Prospect near here. There is a boundary of cattails along the shore so you might consider access across from Hallmark Point. Burland Park - off of Eastcote River Park South There is a walk through from Eastcote providing the best access with parking. The other end of the pond is much busier. Burland Park - off of Burland River Park South Parking can be found on Chancery Bay. Lindsey Wilson Park Island Lakes - off of Dockside Way There are several other good locations access this circular pond with tunnels and sheltered bays. See Island Lakes Drive near the bridges, Opposite Cassin Cres, Beside the bridge off of Desjardens Dr.
Edgewood Park - South Dale off of Edgewater. Van Belleghem Park - South Dale There is a small causeway between two small ponds that can be accessed off of Edgewater, Clearwater, or Lake Park. Sun Valley Park Fairly exposed, especially if the wind is from the south or south west. Access is off of Sun Valley drive. There is (was) a pull in off of Springfield as well that I have used but that might be for access/service to the hydro lines and parking might not be allowed. Kilcona Park. It has been many years since I paddled here and taught some courses - it appears access at Harbour View is limited now as there is a sign at the gate that says private watercraft are not allowed. Kildonan Meadows Park off of Dawnville Dr. This is a somewhat exposed lake, especially from the south. Silverfox Estates - Birds Hill. Right in Birds hill - great little lake made from gravel quarry. There is parking off of Birds Hill Rd. I have also gone in off of Camsell Ave but the south end of the lake can dry up somewhat in the summer. Birds Hill Park. Although I have paddled here in the past you should check with park staff before you put your boat in the water. Paddling is not allowed off of the beach or swimming area. Confirm with the park that you can still paddle on Kingfisher Lake.